“Spider” John Koerner. Dave “Snaker” Ray. Tony “Little Sun” Glover. The names are legendary, and the seminal country-blues trio they formed in the early Sixties influenced a musical era with its passionate treatments of rare blues stylings. A self-described fun-loving trio of misfits, they turned audiences on their heads with foot-stomping performances throughout the U.S., and their series of Elektra recordings, commencing with Blues, Rags and Hollers, are considered the cornerstone of the Sixties folk/blues revival. Though based in Minneapolis, Koerner, Ray and Glover first connected in New York City in the spring of 1962. Glover was visiting his pal Ray when Koerner dropped in from Upstate. Amidst the bar hopping and jamming, the three clicked, and the trio was born. By that fall, they were back in the Twin Cities, jamming and playing clubs and parties. 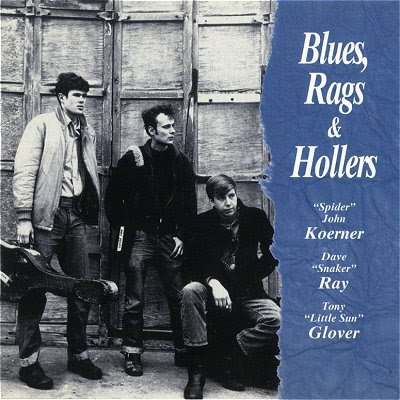 In 1963, with the help of the editors of the Little Sandy Review, Koerner, Ray & Glover hooked up with Audiophile records in Milwaukee and in one twelve hour session, recorded Blues, Rags & Hollers. They sold several hundred records at gigs and put copies into the hands of a few influential people, including Jac Holzman at Elektra Records. When Holzman got around to listening to it he was blown away, and signed them to a recording contract. Elektra also bought the Blues, Rags & Hollers masters from Audiophile, but found that the album’s significant length posed mastering problems, and deleted four songs before releasing it in November. Eventually, Koerner, Ray & Glover cut five albums for Elektra, with an intriguing mix of string-band, ragtime and down-home blues styles. They performed at the Newport and Philadelphia Folk Festivals as well as on the club and college circuit. Their raucous enthusiasm and musical acumen breathed life into traditional material and they earned fans that included John Lennon and the Doors. During the Sixties, Koerner kept up his solo career and in 1969 recorded the classic Elektra album Running, Jumping, Standing Still with Willie Murphy. In the Seventies, he turned to other interests and moved to Denmark for several years. In Denmark, Koerner immersed himself in traditional American folk music. Falling in love with this genre, he began to forgo original compositions for traditional songs into which he infused his own interpretation, style and energy. 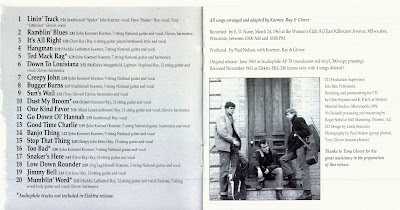 Back in Minnesota in 1980, Koerner went into the studio with an outstanding group of sidemen that included Peter Ostroushko, Butch Thompson, Willie Murphy, Tony Glover, Dakota Dave Hull, and the Boston area’s bones-rattling wizard Mr. Bones. In one night while a tornado raged outside, the group recorded what has been described as one of the great folk records of all time. 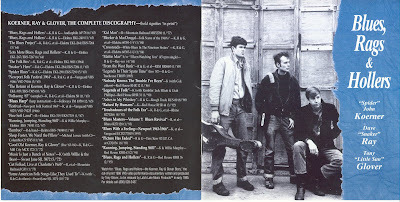 In late 1986, Red House released the session under the title Nobody Knows the Trouble I’ve Been. The critical response was unanimous, with accolades like “Comeback of the Year” and “Leave it to Spider John Koerner - Minnesota's premier blues picker - to salvage the soul of American folk music.” Today, Koerner is still exploring the range of folk traditions. There have been two more critically-acclaimed Red House recordings, Legends of Folk (with Utah Phillips and Ramblin’ Jack Elliott) and Raised By Humans. Red House also released a re-mastered, expanded CD version of the out-of-print Running, Jumping, Standing Still. Koerner’s rollicking treatments of traditional folk songs and self-penned classics seem to only get better and more seasoned with age. This reissue has been digitallyremastered and includes all the tunes from the 1963 Audiophile release, including the four that Elektra dropped on their disc .